Easter is a wonderful time of the year. For many a time of religious celebration, for others an excuse for chocolate exuberance and treasure hunts galore, it is for all a chance for recuperation and reconnecting with family and friends. Moreover, the approach of Easter sees (typically) the return of our much longed for sunshine, golden hued nighttimes and warmer days destined for outdoor lounging on crisp green grass, punctuated with yellow daffodils and buzzing bees. Along with Christmas, Easter is one of the main occasions in my home when my family come together, sharing in hearty and homemade food, whilst clinking glasses and exchanging stories. We watch films, play games and compete somewhat frenziedly in variously themed quizzes, taking moments of respite to fill the kettle, pour the tea and slice a cake. Without doubt, my favourite Easter time (or quiet honestly anytime) indulgence is a simnel cake. The cake itself is made up of a delicately spiced sponge, bejewelled with glistening crimson and golden dried fruits, and hiding within it a sweet, sticky centre of marzipan. Traditionally, the spices used in the sponge are cinnamon or mixed spice, but I personally find these a little too heavy for spring time. As such, I have replaced them with the rich, nutty flavour of mahleb and a touch of zingy cardamom for a subtle, seasonal heat. I also advocate the use of lemon as opposed to orange for a fresh and rejuvenating hit which marries perfectly with the soft floral notes of rosewater and the earthiness of organic vanilla. Feel free to be creative with the mixture of dried fruits you incorporate into the cake batter, however I would recommend that you stay within the weight limits advised in the recipe. For me, the buttery notes of dried apricots and super sweet tartness of the morello cherries is a winning combination, especially when housed within a complimentary entourage of perfect purple berries. Amaretto is my choice of alcohol for this cake as its rich almond flavour effortlessly intensifies the taste of the marzipan nestled inside the sponge. What’s more, amaretto pairs magnificently with the sharpness of the lemon and morello cherry - think amaretto sour! The recipe for the icing given below yields a light, fluid mixture. As the cake is so delightfully sweet, a heavy icing would not only be unnecessary, but detract from the subtle spices at play within. The icing should be gently ladled over the cake and allowed to cascade over the edges, gathering haphazardly in golden pools around the cake and leaving note of its journey in lemony drips down the sides of the sponge. The contrast of the butterscotch tones of the icing and vibrant pink of the rose petals is a stunning homage to spring time and temptingly tells of the enjoyment to be had by delving into the cake itself. The cake uses an all in one method, and can be whipped up in mere moments after the fruit has been allowed time to soak. So even if you are short on time, this delight can be put together for visiting or entertaining loved ones in the approach to Easter without hassle. Weigh the dried fruits into a bowl (remembering to chop the apricots!) and tumble together. Add the lemon zest, juice and amaretto to the bowl, then stir again to ensure all the fruit is coated in the liquid. Allow this to stand for at least an hour so that the fruit becomes plump and flavourful. Grease & line a 2lb loaf tin with baking parchment, allowing a small overhang on each side to assist in removing the baked loaf later on. Preheat the oven to 140c (fan). Dust the worktop with a little icing sugar and knead the marzipan slightly to soften. Using your hands, form a cylinder about the length of the loaf tin, and then use a rolling pin to flatten the marzipan cylinder to a rectangle roughly the same dimensions as your baking tin. Cover the marzipan so it doesn't dry out, and then turn to making to cake batter. Add the butter, sugars, flour, spices, salt, eggs, milk, rose water & vanilla to the bowl of a free standing mixer fitted with a paddle attachment (or a large bowl if you are not using a mixer, to be beaten with an electric whisk). Beat the ingredients together on medium-high speed until combined and smooth - this should only take a few minutes. Tip in the dried fruit along with any remaining soaking liquid and beat on a slow speed until the fruit is evenly distributed. Take care not to over beat as the dried fruit is fragile and may break up, leaving soggy patches in the sponge. Carefully spoon approximately half of the cake mixtures into your prepared tin and level. Then, uncover your pre-prepared marzipan rectangle and place on top of the mixture in the tin, patting it down slightly. Top the marzipan with the remaining cake mixture and level once more, using either a palette knife of the back of a spoon. Bake the cake for around 2 hours (though start checking from 1 hour 45 minutes as all ovens differ slightly), until golden, well risen and with a firm top when pressed. A good indication the cake is nearing completion is the welcomely intruding fragrance of sweet fruit and baked lemons. Remove from the oven and place on a cooling rack, allowing the cake to cool completely before removing from the tin. When cool, remove the cake from the tin and set it on a serving plate ready to ice. It is important that the cake is on its serving plate to gain the full visual advantage of the icing. To make the icing, combine the icing sugar with the lemon juice and vanilla and whisk smooth. Using a small spoon, ladle the icing over the cake in a zig zag motion, lingering at the edges of the cake to encourage the icing to drip and run down the sides of the cake. 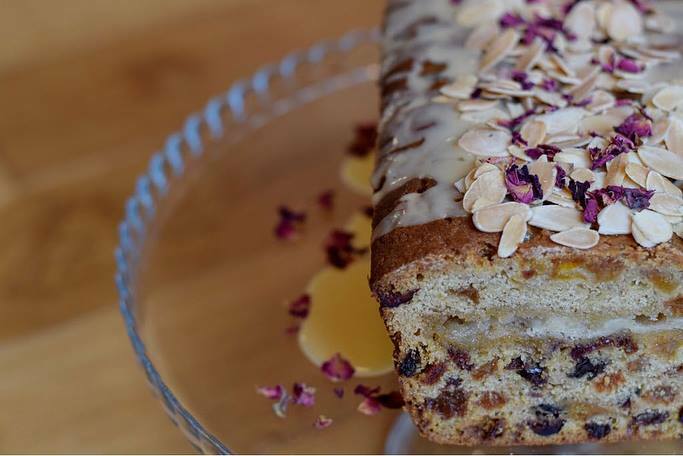 Whilst the icing is still wet, scatter over the toasted flaked almonds, followed by the rose petals. Allow the icing to set a little before slicing. Enjoy generous pieces with afternoon cups of tea or as a post dinner sweet bite. The cake will keep for up to two weeks if kept covered appropriately, though I'm sure this long shelf life won’t be necessary!